The Villa Lobos started on 18th and Damen in the Pilsen neighborhood. I believe they started in the late 1960s or maybe even mid 1960s. They had a club house at 18th and Damen right behind Bishop’s Chili. 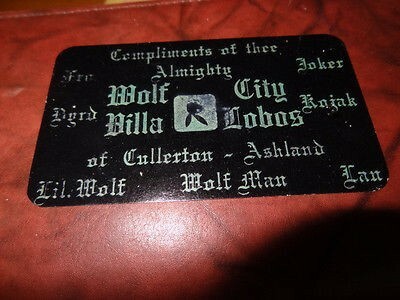 Villa Lobos means “Village Wolves” in Spanish. The Villa Lobos had an alliance with Morgan Deuces and Latin Kings and would invite Latin Kings from Little Village to party with them at the club house. The Villa Lobos were also called upon at a peace summit with Latin Kings, Morgan Deuces and other gangs in the Bridgeport Homes in the Bridgeport neighborhood in the late 1960s, this solidified their relationship with Latin Kings much more. The Villa Lobos existed in Pilsen for approximately 10 years until they moved off 18th Street completely. In the year 1976, the Villa Lobos began moving to 30th and Drake in the Little Village neighborhood. By 1980, the Villa Lobos had grown in popularity and claimed territory from 30th Street and Drake Ave to St. Louis Ave. The Villa Lobos also opened up at 23rd Street and Ridgeway in Little Village by the early 1980s. The Villa Lobos also colonized back into Pilsen as their popularity continued to increase and opened at the intersection of Ashland and Cullerton for quite some time. The Villa Lobos biggest enemy was always the Two Sixs and when it came to the major war between Two Six and Latin Kings in Little Village the Villa Lobos took the Latin Kings’ side as they became good allies. The Villa Lobos also fought with Two Six allies the Sin City Boys. Villa Lobos fought against some rivals in the Marshall Square area like Two Two Boys and Satan Disciples while the Villa Lobos befriended Stone Kents, Cullerton Deuces and Coulter Kings over there. In the Pilsen area the Villa Lobos slugged it out with La Raza and hung out with Latin Counts and Latin Brothers. In about the year 1981 the Villa Lobos joined the People Nation thanks to the Latin Kings as they became even closer allies with Latin Kings. The Villa Lobos had pretty good numbers in the 1980s but by the early 1990s the organization began to fade out due to retirement or members flipping to Latin Kings especially the 30th and Drake section all turned Latin King because the powerful 31st and Drake section was looking to grow even more. The Cullerton and Ashland section closed up by the 1990s then 23rd and Ridgeway shrunk in size to the point where many members moved to the suburb of Cicero at 16th and Austin which lasted until the 2010s decade. Did Villa Lobos ever have People nation enemies? If so why?